Social analytics involves aggregating data about likes, comments, shares of social media posts, volume of posts during a specific time period, changes in number of followers of a brand’s profile, average customer reply times, etc., and leveraging this vast amount of data to discover trends and gather insights about what drives engagement and growth. To date, social analytics has largely been used by marketing and customer service teams. Brands are using insights from social analytics to understand what content works well across marketing campaigns and to inform future campaigns. However, beyond marketing and customer service, there’s a largely untapped opportunity for HR departments to leverage social analytics for competitive analysis and content discovery. Like marketing professionals, HR leaders can use the same types of insights for inspiration on social media content to enhance the hiring brand. HR leaders can discover what other HR departments are publishing on social to attract and retain talent and determine what kind of content is resonating with potential candidates and existing employees. Some social savvy brands have already started to employ social analytics solutions for content development to attract the best and brightest talent. For example, HR leaders at Merck and Co. and Amgen are using Unmetric to uncover content insights for their hiring brands. They are two of our clients that have started using social analytics for HR and both just happen to be in the pharma industry. However, this strategy could be adopted by any brand in any vertical from financial services to airlines to CPG to retail. This initial trend of harvesting insights from social media is likely driven by the fact that HR departments today are increasingly under pressure to reduce employee turnover, which can cost organizations upwards of 20% of the lost employee’s salary. (Up as high as 4 times salary for certain key employees.) The trend among millennials to change jobs after short periods is also exacerbating this problem with Gallup estimates that millennial turnover is costing the U.S. economy $30.5 billion annually. Social media intelligence tools hold great opportunity for all companies that are looking to step up their game when it comes to retaining employees and wooing the most competent candidates. Merck and Co., one of the largest pharmaceutical companies in the world prides itself not only on fostering and nurturing employees’ talents but also promoting diversity and inclusion – something important for many brands today. To push this mission forward, Merck and Co. is using social analytics to help ideate creative content, get better engagement, and obtain insights into their social media efforts for their hiring brand. Amgen is also leveraging social analytics for this purpose, emphasizing company culture and company recognition. Based on insights from social analytics, here are three practices that every HR department can employ that will put them ahead of the pack and help them attract the most talented candidates. Analysis of social data demonstrates the effectiveness of posts that spotlight employee voices and provide a peek at their personal lives. 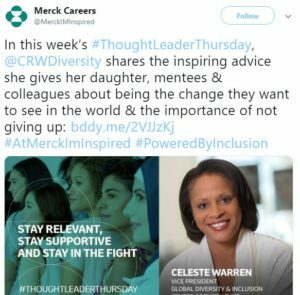 For example, Merck and Co. has established a regular cadence in highlighting employee voices as part of its #ThoughtLeaderThursday series on Twitter. 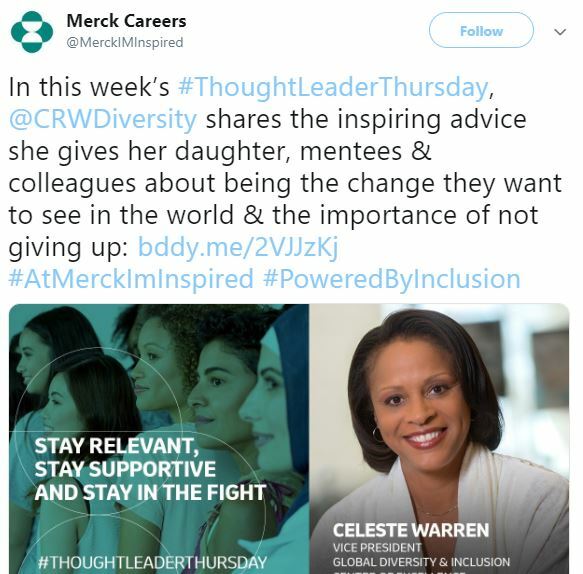 A post from earlier this year featured a video of Merck and Co.’s VP of Human Resources and Global Diversity, Celeste Warren where she shared advice she gives her daughter, mentees and colleagues about making a difference in the world and persevering in the face of challenges. Ajay Patel, HR leader at Merck, says this type of content humanizes the brand and garners significant traction because it inspires and engages audiences. Social analytics helped Merck and Co. come up with these kinds of ideas for content. It’s becoming increasingly important for brands to publish content that is meaningful because it leads to a greater follower base and in turn raises the profile of the hiring brand. In a highly competitive market, it’s no doubt businesses are investing in initiatives to attract and secure first-rate talent. Some businesses are going about this effort in creative ways. For example, Amgen regularly publishes content about how to manage work and home life and also references best practices for attaining success. One of Amgen Careers’ post on Twitter reassures women going back into the workforce that juggling both motherhood and a career is possible. Amgen Careers also provides job seekers tips about how to craft effective resumes and other career advice. Amgen Global talent acquisition leader John Graham agrees that this approach toward social media content yields the best engagement across audiences. Social intelligence can go a long way for HR departments seeking to boost their talent acquisition efforts. By providing life and career tips, HR departments can foster discussion around topics important to job seekers and in this way generate engagement that will receive more visibility for the hiring brand. Social analytics can help HR departments determine what matters most to potential candidates and provide insight into the values they seek in a company. For instance, if a company wants to attract recent college grads with STEM degrees, it can take steps toward hiring these kinds of candidates by producing content targeted specifically to that audience. After putting these efforts into action, the company can apply for awards that recognize it as a leader in that space. Amgen, for example, frequently posts to its social media accounts about awards the company has received, including the 2019 Military Friendly Employers list and recognition as one of the 50 Happiest Companies in America for 2019. Thanks to information gathered from social analytics, Amgen knows that these posts generate high engagement because they are relevant to its audience. In this way, HR departments can be informed by social analytics about values that resonate with employees and prospective candidates, and use that knowledge to apply for company awards that they can later showcase on social media. Social analytics is an area largely untapped by hiring departments at large enterprises but has great potential for attracting the best and brightest talent. HR professionals can use social analytics to help them develop content around different topics, including employee voices, life and career tips for job seekers, and company recognition. They can use this information to guide their company’s brand building efforts across social media and make a difference into how they approach talent acquisition. This might translate into attracting candidates who don’t normally apply for specific jobs, recruiting candidates coming from nontraditional paths, and retaining high-performing employees.